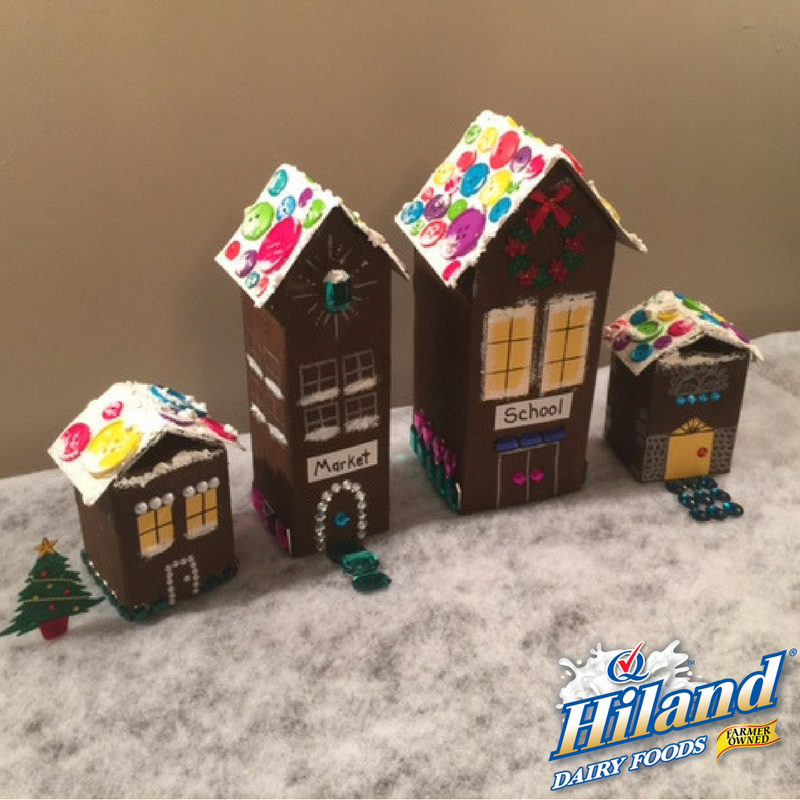 Creating a village out of repurposed Hiland Dairy Milk cartons is a great hands-on project for you and your kids this holiday season. Start saving your cartons now so when holiday break starts, your kids can start crafting away! Follow these step-by-step directions and you’ll have a festive village in no time. 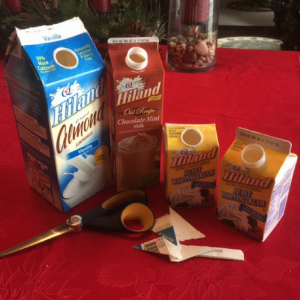 Tip: Hiland Dairy Whipping Cream and Hiland Dairy Half & Half cartons also work. Open the tops of the cartons. At the “pour” side of each carton, cut the upper corner triangle out using scissors, leaving a little border around the “pouring” triangle. Repeat on the opposite side of each carton. 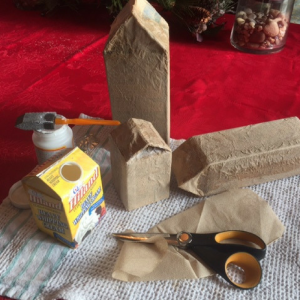 Hot glue or tape the “pouring” triangle of each carton to the side as shown to create the tops. Using scissors, cut off any plastic pour spouts. 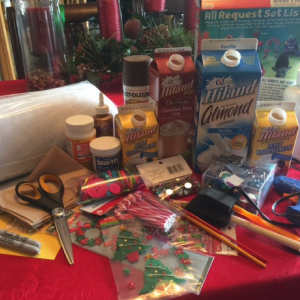 Using a paintbrush, paint a thin layer of Mod Podge onto one side of the cartons and place a paper napkin over the top, gently smoothing it out. Continue this process until all cartons are covered entirely. Allow to dry completely. Using foam paintbrush and Mod Podge, add one more layer of napkin onto each carton. Allow to dry completely. 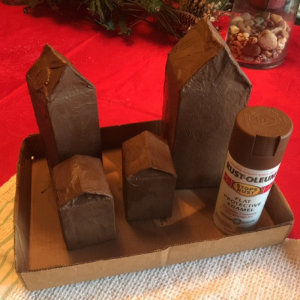 Spray-paint each carton brown. Allow to dry completely. 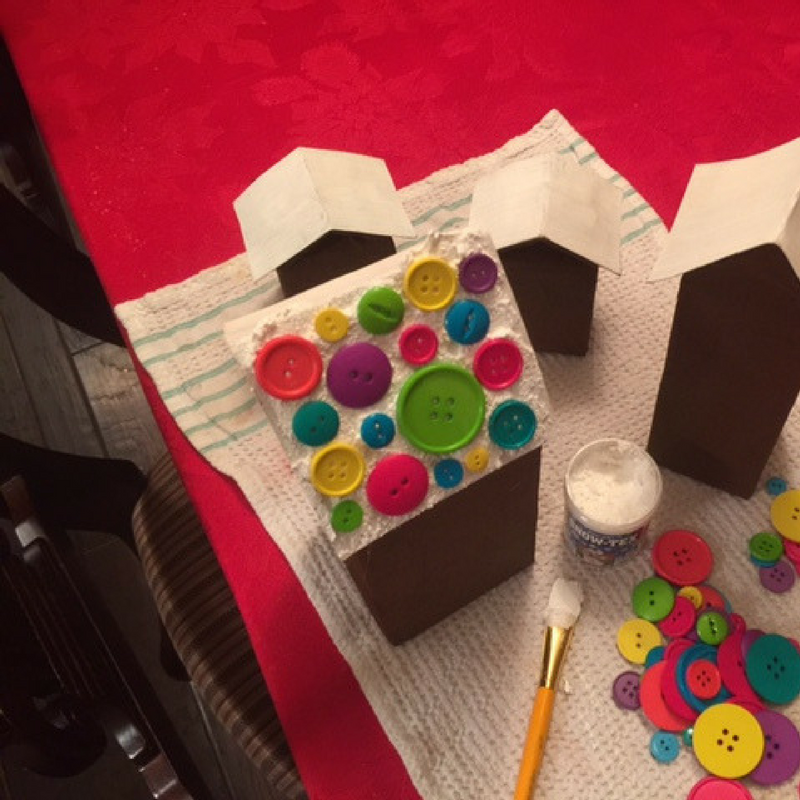 While the spray paint is drying, cut the cereal box cardboard to create a rooftop for each carton. Tip: Cut strips as wide as each carton with a 1/4- to 1/2-inch overhang. 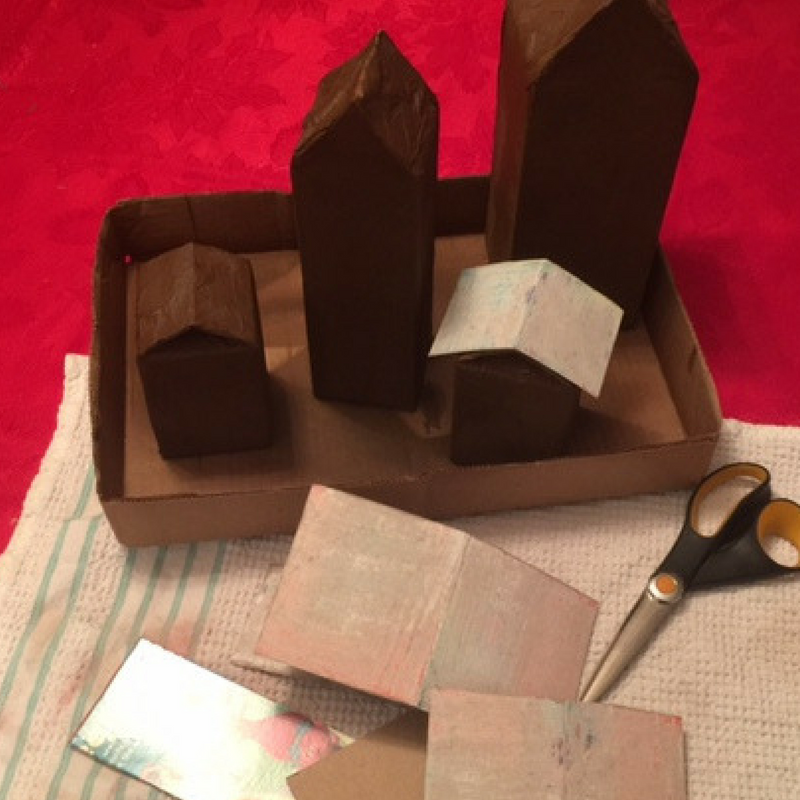 Using sandpaper, rub off the any colored print on the cereal box cardboard rooftops, leaving a rough surface. Paint each rooftop with white acrylic paint. Allow to dry completely. Hot-glue the rooftops to the top of the cartons. Using a nylon or synthetic paintbrush, spread the Snow-Tex on the rooftops and gently press on buttons. Allow to dry completely. 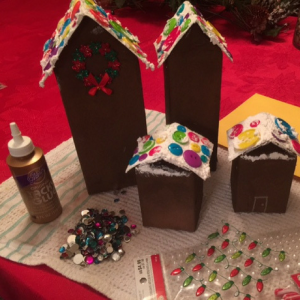 Using tacky glue, decorate the cartons to create a holiday village using markers, stickers, jewels and beads. Tip: I created a couple of houses, a school and a market. 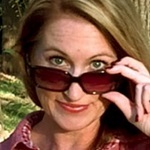 The possibilities are endless, so start creating, Divas! You can add weight to the buildings by pouring some rice or dried beans into each carton before attaching the rooftops.